Curve studied by Dürer (1525), Desargues (1640), Huygens (1679), Leibniz, Newton (1686), de L'Hospital (1690), Jacob Bernoulli (1690), la Hire(1694), Johann Bernoulli (1695), Daniel Bernoulli (1725), Euler (1745, 1781). Complex parametrization: for an epitrochoid and for a hypotrochoid ( ). The term centred trochoid allows to regroup the epi- and hypotrochoids. The centred trochoids are therefore the trajectories of the motions composed of two uniform circular movements. They include the centred cycloids (case , equal speeds) and the roses (case , equal radii). When (equal centripetal accelerations), we get the trochoids with a meplat. ... or as the middle of two points, when written ; the two points describe concentric uniform circular motions (opposite a case (rose), the two circles are identical). Writing , we can separate the circles described by each of the points. Writing , inversely, we obtain all the centred trochoids as the loci of the barycentres with given weights of two uniform circular motions on the same circle. Besides, all the barycentres with fixed coefficients of two points describing uniform circular motions describe centred trochoids. Image drawn with geogebra by Andre Chauviere. The centred trochoids are also the projections on the plane xOy of the satellite curves. This notion can be generalised to a finite number n of uniform circular motions, in any directions, under the name polytrochoid. An example of a 2n +1-trochoid is the 2n +1-sectrix of Ceva with complex parametrization . 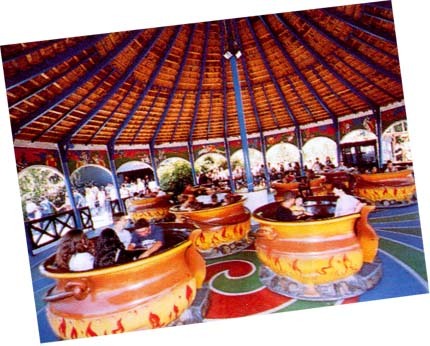 The cauldrons describe epitrochoids; if the cauldron turns around itself, the curve described by its occupants is a tritrochoid. The 3D generalisation is the notion of spherical trochoid.